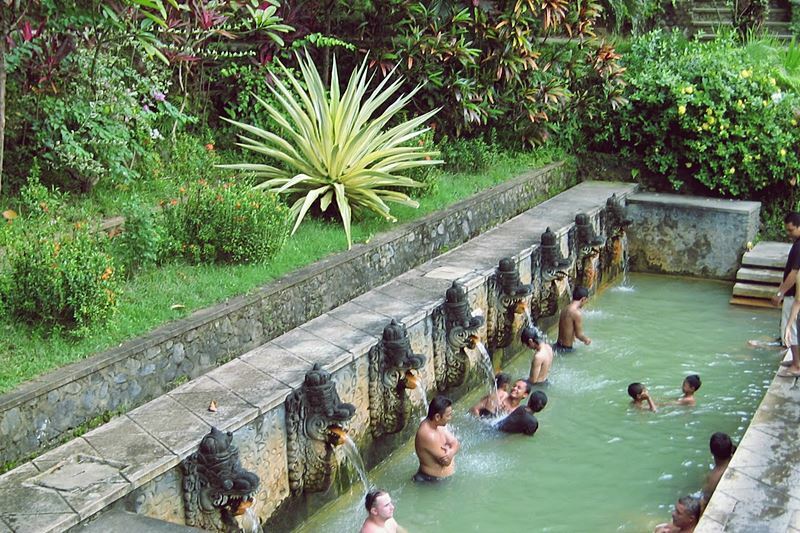 One of famous water springs in Bali is Banjar hot water spring. This attraction place is located in Banjar village, Buleleng regency. Its location is very strategic place or around 80 kilometers from Denpasar. When you visit Lovina beach, you should drop in to this hot water spring because that is not far from this beach. When you start your trip from Ngurah Rai international airport, you will spend around 3 hours only to arrive to this place. This Banjar hot water spring is always crowded by many domestic until international tourists. Many people agree that this is the right place for enjoy many wonderful views. Even, this is a favorite place of many tourists because they can relax and enjoy the quietness of Bali. Taking a bath is one of activities that are usually done in this location. There are three part of Banjar hot water spring. The first water spring has 8 showers with mouth of dragon statue. This will be different with the second pool that has only 5 shower of dragon. That is the widest pool of this hot water spring. Then, the last pool has 3 kinds of shower. This third pool is used by visitor to enjoy water massage which comes from the mouth of dragon statue. Many tourists who are interested to come to this place because they are believe that the water can recover various diseases. Three kinds of various pools in this location with different amount of shower and different deep offer more options. Therefore, you can determine which pool that is right on you. Do not forget to determine kinds of pool which can make you feel more quite, therefore you will get what you hope from this place. One thing that you can do here is taking a bath and enjoying the shower. By taking a bath for a few minutes or hours, this becomes a solution for recovering the diseases. After spending a few times in this place, that will make your body and mind become fresher therefore you can do your next activity better. Do you interesting to visit Banjar hot water spring in Bali? Do not forget to prepare some things that you may need there. Please contact balicabdriver.com to accompany your trip to northern Bali. You also have to prepare around 10.000 rupiahs to buy a ticket. The price will be different for a child. This is very cheap price therefore you can choose this location to be one of attraction when you visit Bali. Please come at 8.00 am to enjoy the freshness of the water or only look around the views inside it. You can also enjoy message and spa near with the pools.